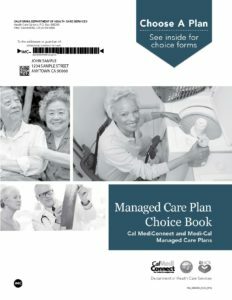 The Department of Health Care Services (DHCS) is proud to announce the new Medi-Cal Managed Care Plan Resource Guide and Choice Book. • Existing dual eligible beneficiaries who move into a CCI county. All of these beneficiaries are already required to enroll into a Medi-Cal managed care health plans (MCP) for their Managed Long-Term Services and Supports (MLTSS) in order to receive their Medi-Cal benefits. These new materials will ensure that this group of beneficiaries receives information on all of their available options – including Cal MediConnect. The new materials incorporate some of the lessons learned about how to most effectively communicate with dual eligible beneficiaries about the CCI, including feedback from stakeholder input and beneficiary testing. Prior to being finalized, these materials underwent a final literacy review to ensure that they meet readability standards and are not above a sixth-grade reading level. All final materials are also being translated into threshold languages and will be available in accessible formats, as required. These materials are SAMPLES, created specifically for stakeholders to view. In these samples, CareMore was mistakenly omitted as a Cal MediConnect option. Actual mailings to beneficiaries will accurately reflect all health plan options for the county in which the beneficiary lives, including CareMore. To avoid confusion, a corrected sample will be posted shortly. Any questions can be sent to info@calduals.org. This will result in persons who are Medi-Medi being eliminated from any private health insurance that they may now have. Is this what they/we want? This concerns me greatly. This results in elimination of private health insurance for those who may already be Medi-medi. In the case of my daughter, who is developmentally disabled, her primary care MD has been with her 25 years, sees her at 8:30am when needed, knows her and has been a kind and considerate health professional all the years that she has been a preferred provider with Blue Cross. I would like to see company logos added to both booklets, where appropriate . Often our beneficiaries identify their company of choice by logo/icon. This happens more often than we think. 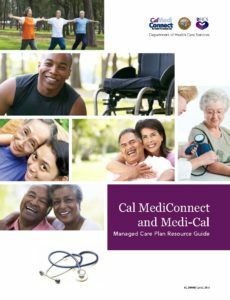 I absolutely love the Calmediconnect booklet! It’s modern, vibrant and easy to comprehend! I’m a photographer, great pictures!! Well done!